Last night I had to clean up my craft desk (and my ‘unofficial storage space’, the futon beside my desk) because my parents are coming for Christmas. I thought I’d stick a podcast on in the background to keep me amused while sorting everything out. I noticed that I had a new episode of Scraptime in iTunes so I turned that on. And then I got out the papers and made more mess! The episode I watched was #446 – Holiday Packaging. 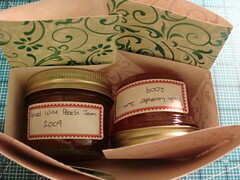 I had just decided earlier in the day to give a couple of my co-workers some homemade jam for Christmas. 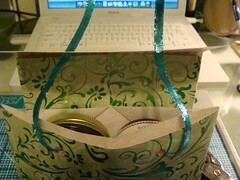 I was just going to bring in the jars, but when I saw this project, I knew it would fit my 125mL jam jars! I used up some Christmas paper, which is good – it’s just going to hang around until next year if I don’t! I made that modification because the jam jars are just a little too big for the box, so they made the sides bow out, and I felt this way would put less pressure on the box. The picture above shows how I threaded the ribbon through the holes. I also made that top piece a little bigger than recommended. I think the red/green box was 3″ wide, and the swirly one was 4″. I like the 4″ width best. I pulled the two Kitchen Tildas out of my bowl of stamped, coloured, and cut out Magnolia stamps. They don’t particularly match, but they don’t clash like crazy either, I think. 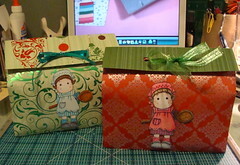 Especially since I used blue ribbon on the box with the blue Tilda. I think I am going to use this box pattern A LOT. I can’t wait to try re-sizing it too! 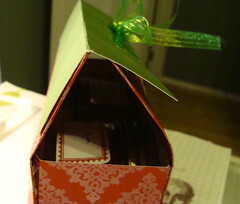 This entry was posted in Baking & Other Food, Christmas, Papercrafts and tagged canning by rycrafty. Bookmark the permalink. in the loan, but it isn’t as essential to achieving success. the borrowers applying for that 24 hour cash loans must be intent on repayment. Hello to all, it’s actually a gooid for me to go too see this website, it consists of useful Information. Good response in return of this question with solid arguments and describing all on the topic of that. return to learn extra of ykur useful information. Thankk you for the post. more informationn about thhe issue and found most people will go alohg with your views on this website. Incredibly useful looking forward to visiting again. You have got remarkable info listed here. You’ve gotten incredible stuff listed here. Just simply desired to tell you I’m relieved that i came onto your website page. Awesome Web page, Preserve the great work. Thanks a ton! Hi there to every single one, it’s truly a fastidious for me to go to see this site, it includes precious Information.